Stone Brewery knows how to make delicious beer. The are the masterminds behind Imperial Russian Stout and Ruination IPA, two of our favorite ales in their respective styles. None of their brews are below average and even the two lowest ABV beer's they've produced lately, Levitation and San Diego County Session Ale are incredibly flavorful. 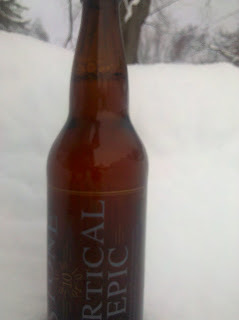 When we saw our sights on the 9th in the series of "Vertical Epic Ales," so we had to try it. 10.10.10 is a Belgian-style strong pale ale that is a combination of pale malt, German hops, wheat, rye and three types of grapes in the second fermentation. On this day we specifically decided to crack into this beer due to the 10" of snow we've had in the last day and a half, it seemed fitting. 10.10.10 pours a hazy, almost apple juice like color with a light white head. It smells of sweet grapes, much the same way Dogfish Head's Midas Touch does. When the beer hits the tongue, it comes out sweet AND sour. The sweetness of this Belgian-style ale hits the tongue initially but you are left with a sour flavor towards the back end. For being a 9.5% ABV brew, the body is incredibly light. The grapes seem to be a bit much as they take away from almost any other flavor. This something that is a bit atypical from stone. Given their collaboration with DFH and Victory that produced a siason and they produce a Belgian-style IPA, Stone is not known for creating beers on this style. They are known for producing almost overly bitter, West-Coast style beers. Not that this is a terrible brew, it is a good attempt at creating something new. However, until Stone perfect's it, they should stick to the hoppy, West-Coast style beers we love.